If you read this, you must really care about what I have to say. Every year since 2009, I wrote a little summary of the passing year and published it here on my personal website. But this year, unlike all others, I haven’t posted a link to this blog on any of the social networks. So the only way you could end up here was to deliberately and consciously type in malanke.com in your browser. And I can’t believe you actually did. Thank you very much for that. You would have noticed that this year I didn’t do any blog writing and had minimal activity on social media. This is because I got fatigued to the point of sickness by the amount of sharing and posting and re-sharing and re-posting everyone does. People of today seem to prefer experiencing travels, concerts, friend reunions, grandma dinners, and even romantic dates through the lense of their Instagrams rather than through bare retinas of their eyes. And what’s there about telling your loved one how much you love them via a public Facebook post? Do I love my wife less if I don’t do it? Hunting for “likes” on social media is an amazing psychological phenomenon for sure. Some people even reduced themselves to what I call “algorithm servants”. On LinkedIn for example, someone has figured out that if you write ridiculously short paragraphs and have double line breaks between them, the algorithm will rank your posts higher and hence more people will see them. So now my feed is filled with posts that read like “Bla bla bla. Line break, line break. Bla bla. Line break, line break.” I find those posts ridiculous and people who write like that — fools. I never read them. Line break, line break. As a matter of principle. Line break, line break. Now that I addressed my absence from the Internet [switches the mood from passive-aggressive to happy], let’s see what good things happened in Roman Malanke’s life in 2017. Two things, really. A new job and a new guitar. No, I’m kidding, of course, there were many more good things. But let’s start with these two. The year MMXVII happened to be the year when I left GlobalLogic, the company I saw grow from about 800 to 12,000 people, the company that connected me with so many great people on four continents, the company that gave me my first management experience, and the company that helped me to relocate to the US. For all these and many other reasons, I’m super grateful to God for placing me in GlobalLogic so early in my career. And after almost ten years, one would think that it must have been difficult to leave, but in reality it was almost too easy. Somehow the way it happens in life, suddenly you just know that it’s time to move on and you move on with ease and comfort. My new professional chapter is with an exciting little company called HackerOne, a pioneer in hacker-powered security. Founded by a bunch of incredibly talented and mission-driven people, the company aspires to make the internet safer by helping businesses of all sizes protect their digital assets with the collective brainpower of freelance cybersecurity researchers (“hackers”) around the globe. I’ve taken a big mission to build scalable processes and systems to enable hyper-productive sales organization. My new workplace is in the middle of San Francisco's Financial District, at the very top floor of a tall historic building. After the first three months, I couldn’t be happier about the work, the people, and the culture at HackerOne. And, of course, the San Francisco city vibe and the product startup dynamics are really cool. The second big thing is the guitar. For my 32nd birthday, my amazing wife gifted me the most beautiful item I’ve ever owned — a shiny Fender Telecaster, American Standard, with a classy black-and-white body, a maple neck, and Custom Shop pickups. An instrument with the potential that is so much ahead of my current playing abilities that it will serve as my inspiration for many decades to come, and eventually will be passed to future generations. To complete the set, I also got a combo amp, which was designed as if per my specification. It’s Vox AV15, featuring elegantly simple design and fully analog models of all my favorite amps by Fender, Vox, and Marshall. With such a great gear, it’s no surprise that I resumed my old hobby full-force and in the last five months spent practically all of my leisure time messing around with the guitar. Another huge change for better that 2017 brought us was our move to a new apartment. Since our arrival to the US three years ago, Olga and I lived in a very modest apartment in downtown San Jose. And this year, finally, we moved to a place which met all our conditions of being quiet, spacious, with lots of natural light, and great surrounding infrastructure. There is a swimming pool with proper 25-yard lanes right in front of our living room. There is also a cozy barbecue zone that we used extensively since we moved in. Lastly, the apartment itself has an awesome den which we use as a work/study space, and which I use as my guitar man cave. In 2017, as Ukrainian citizens, we finally got to taste the feel of visa-free travel to the European Union. After taking part in the 2013-2014 Euromaidan events first-hand, it felt especially good to be greeted by an immigration officer in Rome airport with a simple “Benvenuti in Italia” and having our passports stamped with no questions asked. People in the United States and the European Union don’t really appreciate how great free travel is and take it for granted. The way we decided to celebrate opening the borders was to invite the family for a mini-vacation in Italy. It was a great trip — we spend a few days in The Eternal City and then relaxed at a gorgeous beachside villa at Tyrrhenian Sea. During the year we did many more small trips and other fun things. We went to Mexico twice. 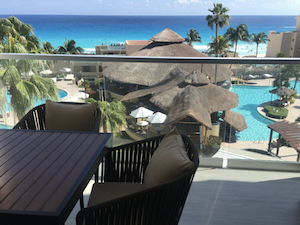 In fact right now as I’m writing these lines, I’m sitting on a balcony facing the beautiful Caribbean Sea in Cancún (that's the picture above), where for the first time ever we’ll be celebrating New Year in warm tropical weather. We also visited Lake Tahoe and Zion National Park for the first time this year. In March, we got to see Red Hot Chili Peppers playing live at Oakland, California. And even though Chili’s will never be the same without my guitar hero John Frusciante, they still did a memorable show. In June we proudly completed another Spartan Race, this time Olga and I did it together with a group of friends as a team. For the upcoming year 2018, as usual, I wrote down my personal goals in 7 areas of life: family, physical, intellectual, spiritual, social, career, and financial. Some of the things that made that list are: completing two triathlons, getting back into skiing, trying surfing, and learning scales on guitar to improve my soloing and improvisation abilities. One fun experiment that I’ll do in 2018 is related to what I started this post with — my fatigue with social networks. In the new year, I’m not going to post anything on Facebook, LinkedIn, Twitter. I actually deleted all three apps from my phone and only will be using them as needed by my professional duties at work. Let’s see what it does to my perception of the world. If there is anything I want to share with the world publicly in 2018, I’ll do it here at malanke.com. Thanks again for coming here and reading this. I wish you and all your loved ones a prosperous and peaceful 2018. Happy New Year!